MIXED results for the Aussie teams on the fourth day of Hot Rod Drag Week 2013. MIXED results for the Aussie teams on the fourth day ofHot Rod Drag Week 2013. The Aussie Attack Torana is out, having run a nine-second pass first time out and then blowing a head gasket on the second attempt. The boys tried to limp the car to the final track in Kentucky, but not no avail. The Faraone Charger team fixed their diff, ran some good passes, then blew another rear end, which they'll re-engineer and then head to Kentucky, a staunch effort! At the head of the field, Tom Bailey's Camaro ran a 6.96@211mph. It has now run a six-second pass at every track. 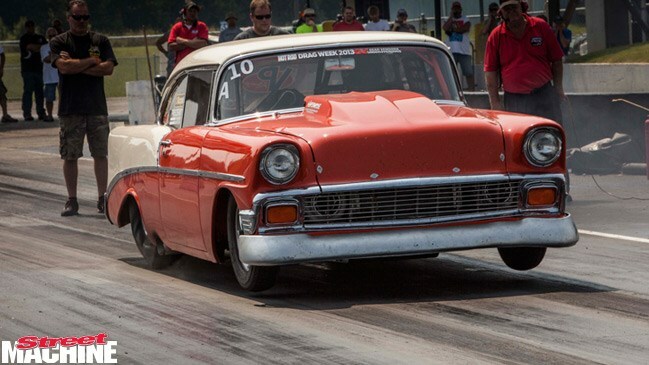 Joe Barry's '56 Chev (pictured) has done an awesome job of keeping the Pro Mod cars honest at Drag Week, running some staunch low-seven second passes; but isn't going to make it the final day. Keep up with the last day’s events on Street Machine's Facebook page.